Moo0 Color Picker lets you easily pick any color from your screen. It is very easy to use, and you just need to press Alt key on any part of your screen. It also comes with simple color adjustment features. This simple tool may be useful if you work on designing and often wonder about colors. Chinese (Simplified) (Revision) support was made possible by Zhang Zhe. Thanks really a lot!! 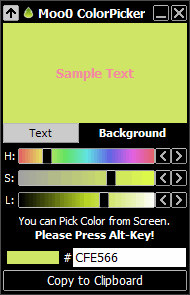 - Its English name has changed from "Moo0 ColorPicker" to "Moo0 Color Picker".